Susan and I just returned from another trip to San Francisco. We babysat our 10 months- and 3 years-old grandsons while Sarah and Evan travelled to Dallas. They were invited to cook with the staff at a hot, new Dallas restaurant, FT33. Sarah and Evan and the local chef alternated dishes for an 8-course tasting menu with wine pairings. The place was sold out, and Sarah got to see Corey and Megan, school friends of our other daughter, along with a fellow member of her crew team at the University of Texas. My cooking task was more challenging: I was charged with feeding the two little ones. Actually, the 10-month-old was not difficult. He is still drinking a lot of liquids, and he will eat anything else you put in front of him. The three-year-old was another story. The first morning, he wouldn’t eat his cheerios until I added some milk, so the next morning I anticipated him and poured in the milk. That morning he decided he didn’t want milk, so I had to scrap the first bowl. The next morning I made French toast with maple syrup. He didn’t like it, but the 10-month-old polished it off. My greatest failure turned out to be lunch. I put together some things for his lunch box for nursery school. My first thought was a peanut butter and jelly sandwich. What child doesn’t like PB&J? Besides, PB&J is not forbidden at his nursery school as it is in many places. As I was planning my menu, Sarah sent a text message that the toddler doesn’t like peanut butter. I made a quick change of plans and substituted some chèvre that I found in the fridge. Then, I reached for a jar of fig jam when he announced that he didn’t like jelly. For that, I substituted some hummus. I thought a goat cheese and hummus sandwich on whole wheat bread looked pretty tasty, so I packed it with freeze-dried strawberry slices, crispy apple chips, and a stick of string cheese. Imagine my disappointment when the lunch box came home at the end of the day with only the string cheese gone. We took advantage of the kids being at nursery school by taking a little trip to the Embarcadero and enjoying a good lunch at the well-known Fog City Diner. I was more successful with dinner one night. I found some packaged gnocchi and a cooked chicken breast in the refrigerator along with some mushrooms and colorful “snacking peppers”. I put it all together with some brown butter sauce, and it turned out to be a huge favorite with both kids. In a small saucepan over low het, melt the butter. Heat gently until the milk solids float to the top and begin to brown. Skim off the solids with a tablespoon. Pour the melted butter into a small bowl, leaving any remaining solids on the bottom of the saucepan behind. Wipe the pan clean, return the clarified butter, and continue to heat over a low flame until it turns a nut-brown color. (hazelnut to be specific) Stir in the lime juice and set aside. Shred the cooked chicken with two table forks. Set aside. Sauté the sliced mushrooms in 2 tablespoons of the butter sauce over medium heat. Add the remaining butter sauce. Stir in the shredded chicken and pepper slices until heated through. In the meantime, boil the gnocchi in a pot of boiling salted water according to package instructions. Drain. 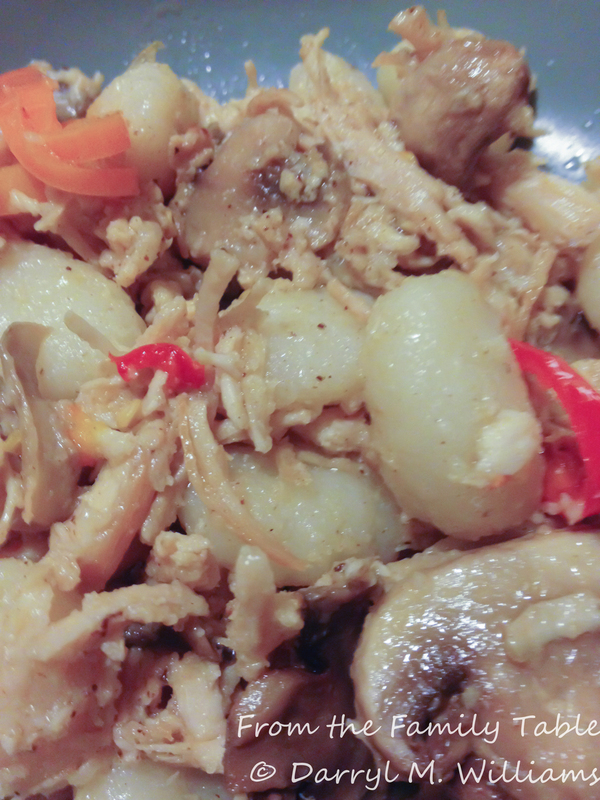 Return to the pot, and stir in the butter sauce, mushrooms, chicken, peppers, and grated cheeses. Adjust seasoning with salt and pepper. Lately I have been watching some DVDs I purchased from The Great Courses. If you are not familiar with that company, they offer video recordings, and sometimes accompanying books, prepared from the lectures of outstanding instructors. You can study art appreciation, Egyptian history, architecture, and just about any other topic you can think of. They have a series on cooking as well as on wine appreciation, so I bought both. One of the instructors in the cooking series is Bill Briwa who is a Chef-Instructor at the Greystone, California campus of the Culinary Institute of America (CIA). Briwa has a very personal and comfortable teaching style, and on top of that he offers a lot of good information and easy-to-follow demonstrations. The DVD set that I am currently watching is called The Everyday Gourmet: The Joy of Mediterranean Cooking. As the title suggests, there are recipes and demonstrations from Spain, Provence, Italy, Greece, Turkey, and North Africa. My blogging friend, Happiness Stan Lives, recently received a tagine (His had eyes), and so he demonstrated how to make a Moroccan tagine. I was surprised to learn from Bill Briwa that a “dry” tagine is made in Tunisia without the peaked hat cooking device. Since I don’t have a Moroccan tagine (That is a hint to my family.) I thought I would give the Tunisian version a try. In a bowl, mix the ground lamb with the cardamom, cloves, cinnamon, ginger, coriander, and black peppercorns. Set aside. In a separate bowl, combine the beaten eggs and grated cheese. Set aside until ready for assembly. Heat the oil in a skillet over a medium-high flame. Add the onions and cook until translucent. Then add the ground lamb mixture, stirring until the lamb is well browned. Turn off the heat and let the mixture cool. Using a pastry brush, coat the inside of a shallow baking dish with olive oil. Then pour in 1/3 of the egg-cheese mixture, tilting the dish to completely cover the bottom. Spread ½ of the lamb mixture over the egg-cheese mixture. Spread ½ of the ricotta over the lamb. Press 6 hard boiled egg wedges into the ricotta, distributing them evenly. Cover with 1/3 of the egg-cheese mixture, spreading it as evenly as possible. Top with the remaining lamb and ricotta, pressing the remaining 6 hard-boiled egg wedges into the ricotta between the other wedges. Pour the remaining 1/3 of the egg-cheese mixture over the top, spreading it so that it completely covers the other layers. Bake in the middle of an oven preheated to 375°F for 40 minutes or until the eggs are completely cooked and the top is beautifully browned. Remove from the oven. Sprinkle with chopped parsley. Serve while still warm. Serves 4. Too late for the Super Bowl, but not too late for a cold winter night. White Chili has some similarities with a bowl of Texas Red, but it is more like a cousin to green chile chicken stew and chicken posole. They all use some of the same ingredients with the main difference being the use of beans, potatoes, or hominy. Susan and I first had a bowl of white chili many years ago in Santa Barbara, California, when we were attending a conference. We both thought it was delicious, but couldn’t figure out how to make it. Some time later, I found a recipe in a magazine. Over the years, I have made modifications to that magazine recipe, and this version comes from our family cookbook, Let’s Cook! Let’s Eat! Boil the chicken in the chicken stock for 20 minutes or until the chicken is cooked through. Drain and reserve the chicken stock. Cool the chicken and shred into bite-sized pieces. Set aside. In a heavy soup pot, heat the olive oil, and then sauté the onions until translucent. Stir in the chiles, garlic, cumin, oregano, cloves, and cayenne. Sauté for an additional 2 minutes. Add drained beans and chicken stock. Bring to the boil and then reduce to the simmer for 2 hours or until the beans are cooked through. When the beans are done, add the chicken and grated cheese, stirring until the cheese melts. 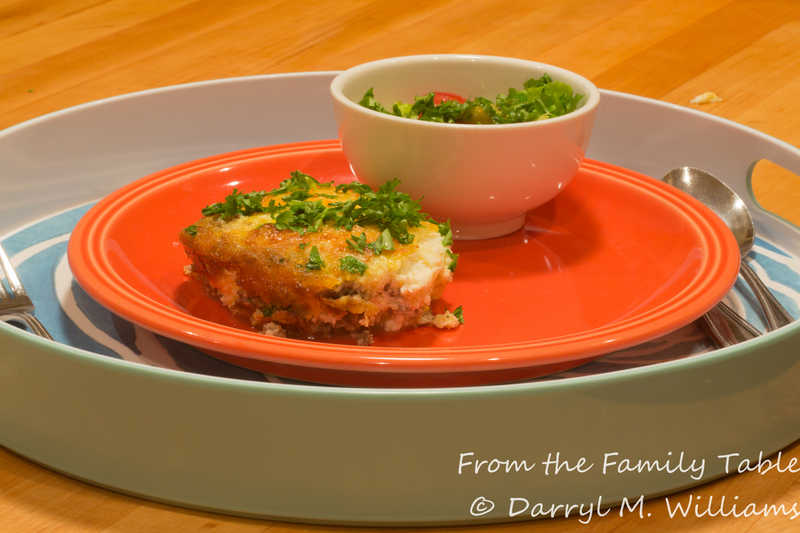 Serve in individual bowls with the additional cheese, sour cream, salsa, and cilantro as garnish. This is one of the easiest recipes around, but it is also easy to mess up. When it is done properly it cam be ethereal. The first time I ever had it was some thirty years ago in Tlaquepaque, Mexico, a small town filled with artisans on the outskirts of Guadalajara. We had taken our children and one of their friends on a family vacation to the Mexican west coast, and this was to be our day of tourist shopping. The array of handmade goods was overwhelming. There were weavings, pottery, jewelry, worked silver, paper flowers, hand-made furniture, and the requisite “onyx” chess sets. After a full morning of going from one vendor’s stall to another, everyone was ready for lunch. We chose a huge open air restaurant, partly because there were enough vacant seats for all of us. The first thing we ordered was queso fundido and freshly made corn tortillas to snack on with drinks until our main dishes came. Dipping browned and molten cheese out of a dish and heaping it on a warm tortilla was a treat for all of us. There was crumbled crisp chorizo on top, but no chiles and no spice. It was just plain good eating. We ate quickly, and that was a good thing. 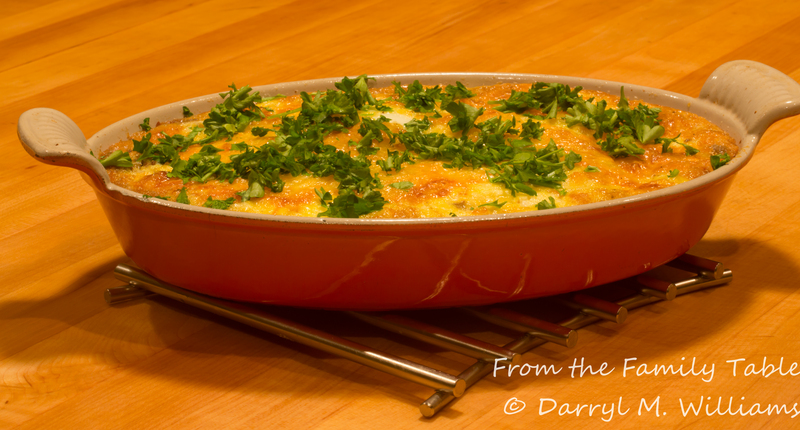 When queso fundido cools off, it can set up into a solid chunk of cheese. Since then, I have enjoyed queso fundido, aka queso flameado in many places along the US-Mexico Border. Most of those versions have been good, but none as good as that in Tlaquepaque. The dish is not to be confused with another stalwart, chile con queso. In its traditional form, that dish includes melted cheese and roasted green chiles. Neither queso fundido nor chile con queso is to be confused with versions you are likely to see in fast-food Mexican restaurants: Ro-Tel mixed with melted Velveeta, or worse, Cheez Whiz mixed with bottled taco sauce. When you make your own queso fundido, use authentic asadero cheese if you can find it, Mexican chorizo of the best quality, and corn tortillas that you make yourself.None of that is really very hard. If you can’t find asadero cheese, any yellow melting cheese like Monterey jack, American Muenster, or mozzarella will do. Serve with your favorite salsa or even guacamole or both. Heat a shallow baking dish, about 9 inches across, in the middle of an oven preheated to 375°F for about 5 minutes or until hot. Remove the heated dish from the oven. Sprinkle the grated cheese evenly in the dish. Top with chorizo, and return to the oven for 10-15 minutes or until the cheese is completely melted and lightly browned. Remove from the oven. Set on a heat-resistant surface. Serve immediately with warm fresh corn tortillas and spoons for dipping the melted cheese.